Studio E, Linde Center for Music and Learning, home to the new Tanglewood Learning Institute and its 140 programs. Photo: Winslow Townson. Tanglewood Learning Institute programs will explore the ways in which music illuminates the human experience by linking Tanglewood performances to relevant themes from the worlds of visual arts, film, history, philosophy, and current events, and offering experiences that dissolve the traditional barrier between performer and audience. TLI’s immersion weekends, interactive talks, films, open rehearsals, master classes, unconventional performances, and visual arts programs will use music as a point of departure and a gateway leading to spirited dialogue, designed for all who aspire to expand their horizons and connect with other curious knowledge-seekers. The Big Idea features dynamic thinkers and luminaries in compelling presentations on a diverse array of subjects and perspectives, contextualizing themes of Tanglewood’s concert repertoire. Presenters in 2019 will include Madeleine K. Albright, Secretary of State (1997–2001) and one of the most celebrated diplomats of our era; Doris Kearns Goodwin, the Pulitzer Prize-winning author and historian; and Daniel L. Shapiro, world-renowned expert on negotiation and conflict resolution, founding director of the Harvard International Negotiation Program, and best-selling author of Negotiating the Nonnegotiable. For Ms. Albright’s appearance, TLI invites participants to explore the idea of nation-building in the 21st century, inspired by Giuseppe Verdi’s contributions to the political unification of Italy in the mid-19th century and tied to the BSO’s performance of Verdi’s Requiem on July 13, led by Music Director Andris Nelsons. July 27 and 28’s concert performances of Wagner’s Die Walküre, with its multigenerational saga of power and love, serves as an intriguing backdrop for Goodwin’s discussion of leadership in America. Daniel Shapiro’s talk, which examines the complexities of freedom, peace, and shared humanity in the 21st century, coincides with August 24’s BSO performances of Schoenberg’s Friede auf Erden (Peace on Earth) and Beethoven’s Ninth Symphony (“Ode to Joy”). Daniel Shapiro – August 24, 5pm, Ozawa Hall; in re: August 25, Schoenberg’s Friede auf Erden and Beethoven’s Ninth. Led by world-renowned musicians, TLI OpenStudio master classes provide the rare opportunity to witness up close the Fellows of the Tanglewood Music Center—all emerging artists of the highest caliber—fine-tune their interpretive skills and explore nuances of the classical repertoire. TLI participants will have front-row seats to master classes with Andris Nelsons, Renée Fleming, Leonidas Kavakos, Stefan Asbury and Emanuel Ax, Jean-Yves Thibaudet and Gautier Capuçon, and Yo-Yo Ma and experience the unique dynamic between teacher and student and the myriad ways in which they challenge, influence, and inspire each other. 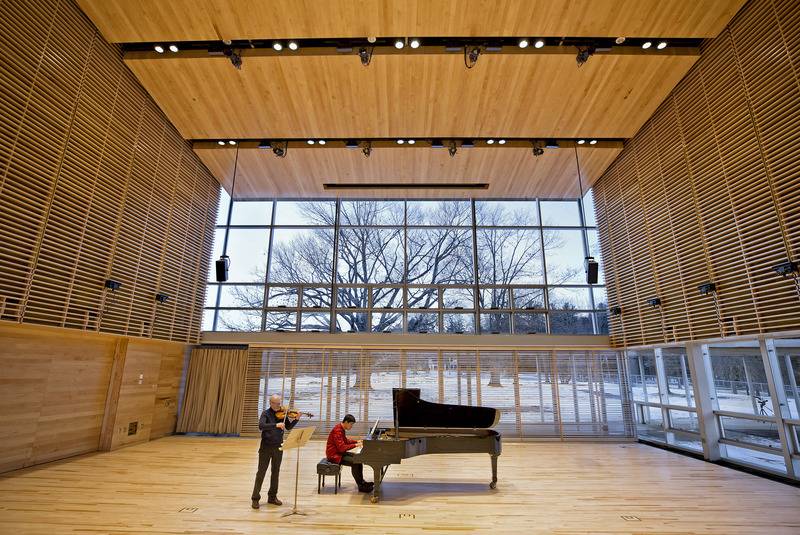 Most of the TLI OpenStudio presentations will take place in Ozawa Hall, except for the one led by Maestro Nelsons, which will occur in Studio E of the Linde Center for Music and Learning. Full Tilt invites participants to indulge their curiosities and experience unconventional, subversive performances that are exhilarating, hypnotizing, and deeply human. Participants will explore a wide array of topics through bold, theatrical productions that include The Black Mozart with Bill Barclay and Concert Theatre Works, a survey of the life and music of Joseph Boulogne, Chevalier de Saint-Georges (1745–1799), and performance artist Meow Meow’s masterful deconstruction of a traditional cabaret, entitled Pandemonium. The Australian postmodern diva brings her unique brand of “musical mayhem” to Tanglewood in the first of a three-year collaboration with TLI. In addition, on August 4, participants can immerse themselves in a multisensory presentation of musical selections from the John Cage Song Books and film associated with Mr. Cage; the event is curated by soprano Tony Arnold and pianist Stephen Drury and is presented with the Cinematics series. Meet the Makers features public conversations with some of the world’s most celebrated artists—from composers and playwrights to instrument makers—about the creative process and the inspiration behind their original manuscripts, compositions, and craftsmanship. In 2019, Meet the Makers will feature an array of artists and artisans, including playwright Tom Stoppard, composers André Previn and Joan Tower, Meow Meow, master bow maker Benoît Rolland, piano technician Steve Carver and the Steinway Spirio digital piano-player, and Alan Weiss and Aiven O’Leary from the William S. Haynes Flute Company. The Meet the Makers presentations will take place in Studio E of the Linde Center for Music and Learning. In collaboration with the Berkshire International Film Festival, Cinematics encourages participants to explore and celebrate the relationship between music, cinema, and the human spirit with curated films inspired by Tanglewood’s concert programming. For example, a performance of Bach cantatas at Ozawa Hall will be paired with a screening of Tous les Matins du Monde, which explores the life of Bach’s contemporary, the composer Marin Marais. Similarly, a performance of Verdi’s Requiem takes on deeper meaning when followed by Defiant Requiem, an acclaimed documentary about the performance of the piece by Jewish prisoners at Theresienstadt, the Nazi concentration camp. The presentation of the film The Four Horsemen of the Apocalypse with a score by André Previn is being presented as part of Tanglewood’s celebration of Mr. Previn’s 90th birthday year, along with a BSO performance of his Violin Concerto, Anne-Sophie, with dedicatee Anne-Sophie Mutter as soloist on July 6, and the world premiere of Mr. Previn and Tom Stoppard’s Penelope, featuring soprano Renée Fleming and the Emerson String Quartet, on July 24. The Cinematics film series will take place on Sundays at 7 p.m. in Studio E of the Linde Center for Music and Learning. ShopTalks are weekly Thursday dialogues where Tanglewood artists “talk shop” about life in the arts, share passions and inspirations, and discuss their visions for the future of the art form with creative colleagues. Through authentic, engaging conversations between artists from a variety of personal and professional backgrounds, one can experience candid insights that contextualize and deepen one’s appreciation of classical music. The series begins with a conversation with bass-baritone Ryan Speedo Green, whose journey to the stage is memorialized in Daniel Bergner’s Sing for Your Life: A Story of Race, Music, and Family. Later pairings include BSO clarinetist Thomas Martin with Margo Garrett, a former race car driver who is now a renowned vocal coach and collaborative pianist, and conductor Giancarlo Guerrero with bass Morris Robinson. ShopTalks take place on Thursdays at 1 p.m. in Studio E of the Linde Center for Music and Learning. From its vibrantly green lawns and maze-like gardens to its breathtaking views of the Berkshire Hills, the Tanglewood campus has provided visitors with a sumptuous feast for the ears—and the eyes—for nearly a century. Through a collaboration with IS183 Art School of the Berkshires, Focal Point gives amateur artists added opportunities to hone their skills in photography, painting, and drawing using the immense natural beauty of the Tanglewood campus as a backdrop. Starting this Tanglewood season, participants can receive one-on-one mentorship from IS183 Faculty Artists—local professional photographers, painters, and illustrators. Focal Point activities take place on Saturday mornings at 10 a.m.; participants will meet at the Martignetti Lobby of the Linde Center of Music and Learning. Further program details for Focal Point are available at www.tli.org. The String Quartet MasterPass will take TLI participants on an immersive, highly interactive, eight-day adventure, June 22-30, with the Juilliard String Quartet and Tanglewood Music Center faculty and Fellows that focuses on the beauty, complexity, and collaborative spirit of this extraordinary genre. The String Quartet MasterPass includes full-length chamber music performances, with beloved works from the canon alongside exciting contemporary pieces. Participants will have front-row seats as talented Tanglewood Music Center Fellows prepare, refine, and perform great works from the string quartet repertoire. In addition to attending string quartet rehearsals and performances, TLI participants will enjoy a table talk dinner with fellow string quartet enthusiasts and members of the Juilliard String Quartet, Tanglewood Music Center faculty, and TMC Fellows. The String Quartet MasterPass activities will take place in Ozawa Hall and the Linde Center for Music and Learning’s Studio E and Cindy’s Café. Visit www.tli.org for further program details and specific dates and times for all the String Quartet MasterPass activities. TLI MasterPass provides participants with a multi-spectrum insider’s view of the artistic process, allowing them to choose some or all of 40 different behind-the-scenes musical experiences during the summer. Activities include rehearsals with the BSO, TMCO, and The Knights with violinist Gil Shaham; open master classes that range from mezzo-soprano Stephanie Blythe leading a class on American Popular Music to pianist Paul Lewis teaching a class on Haydn; and thought-provoking music appreciation talks, such as Avner Dorman discussing his new double concerto for violin and cello, insights about the Hong Kong Chinese Orchestra’s fusion of traditional and contemporary music, and a pre-concert introduction to Penelope, a new work for soprano, string quartet, and piano by André Previn and Tom Stoppard, written especially for Renée Fleming and the Emerson String Quartet. Most of the TLI MasterPass activities will take place in the Shed and Studio E of the Linde Center for Music and Learning. The Boston Symphony Orchestra has released the schedule for the 2019 season at Tanglewood, which will be remembered for the opening of the Tanglewood Learning Institute, the four buildings overlooking Seiji Ozawa Hall on the Leonard Bernstein camopus. Music director Andris Nelsons will be present for the month of July, conducting 13 programs, including the world premiere of a new work by Kevin Puts, The Brightness of Light, based on letters of Georgia O’Keeffe and Alfred Stieglitz on July 20, and a concert performance of Wagner’s complete Die Walküre on july 27 and 28. Details of programs in the Tanglewood Learning Institute will be announced on Feb. 7, 2019.